BOSTON (AP) -While Boston improves its playoff chances, the once-proud Toronto Maple Leafs have fallen on hard times. Tim Thomas made 30 saves, Phil Kessel and Peter Schaefer each had a goal and an assist and the Bruins eliminated Toronto from playoff contention with a 4-2 win Thursday night. "Toronto is the hockey mecca," Bruins forward Glen Metropolit said. "The Maple Leaf symbol is known around the world and it is unfortunate what has happened." The Bruins moved into a seventh place tie in the Eastern Conference with idle Philadelphia, while Toronto missed the playoffs for the third straight year. It was the first time since the 1926-28 seasons the Leafs have gone three years without a playoff appearance. "I see a lot of things I like that we can build on moving forward," Maple Leafs general manager Cliff Fletcher said. "We are determined to bring this team to the next level. Nothing happens quickly, there are no quick fixes or miracle cures." Boston swept Toronto in a home-and-home series after winning 6-2 on Tuesday. The Bruins won the season series 5-2-1. "We have a lot of guys stepping up and that's what good teams do," Glen Murray said. "I didn't think Toronto was going to go away and let us have it, but we need the wins more than them." Murray increased Boston's lead to 3-1 with a power-play goal midway in the third period, but Pavel Kubina gave Toronto a ray of hope when he cut the deficit to 3-2 with 4:59 remaining with a power-play goal. Toronto has a goal with a man advantage in 10 straight games. But 23 seconds later, Schaefer put the game away when his shot deflected in off Toronto forward Jason Blake for a 4-2 lead. "Obviously, it's real disappointing. We really battled over a month to keep this race going," Leafs forward Nik Antropov said. "You can say there is always next year, but three years in a row ... it's getting on your nerves and it's not a fun feeling." The Bruins improved to 3-1-2 in their last six and face Ottawa at home Saturday. Boston went ahead 2-1 when Schaefer, scratched the previous five games, passed to Kessel, who got behind the Toronto defense. Kessel deked Vesa Toskala for the goal 5:47 into the third period. After the goal, Maple Leafs coach Paul Maurice and Pavel Kubina screamed at the lineseman for an offside call, to no avail. "There's a lot of pressure there," Bruins coach Claude Julien said. "Being from Ottawa, I know firsthand about the expectations and the demands of the fans." Jiri Tlusty tied the game at 1 when his wrist shot beat Thomas in the second period. Mats Sundin and Antropov assisted on the goal; each returned to the Maple Leafs lineup after missing five and four games, respectively. Toronto has allowed 14 goals in the last three games and had its six-game road winning streak snapped. "If we played the way we had the last 20-25 games, we wouldn't be in this situation," Toronto forward Alex Steen said. Marco Sturm gave the Bruins a 1-0 lead late in the first period when he slipped a cross-ice pass from David Krejci past Toskala. The Maple Leafs became the fourth team in the conference eliminated from playoff contention. Toronto joined the New York Islanders, Atlanta Thrashers and Tampa Bay Lightning. Notes: Boston's Chuck Kobasew will miss four to eight weeks with a broken leg after getting hit by Zdeno Chara's slap shot Tuesday night. ... Toskala made his 29th consecutive start for Toronto. ... Milan Lucic received the Bruins' annual 7th Player award before the game. ... The teams played 11:53 without a stoppage in the first period. 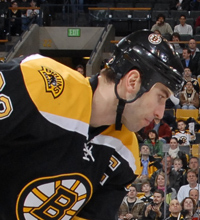 ... Boston's Marc Savard missed his second straight game with a back injury.